For some reason I’ve never been excited by drones. I have nothing against them, but they seem like the kind of thing you give someone as a present and they maybe use it once. That said, I do think drone racing is pretty awesome, and Amazon drone deliveries are fascinating. But it wasn’t until recently that I heard about a drone idea that really got my juices flowing: A drone that can carry a human. As I typed that, I realized, “Isn’t that just a helicopter?” And I guess it kind of is. But in another way, it isn’t! Because it’s completely autonomous, and it requires a lot less horizontal space. You just climb in, enter your destination, and sit back to enjoy the (probably extremely loud) ride. I just love the idea of using all the vertical air space that currently goes wasted due to our reliance on old-fashioned roads. It’s like if all of the shelves in your house were no more than 12 inches tall. There’s so much more we could be using! 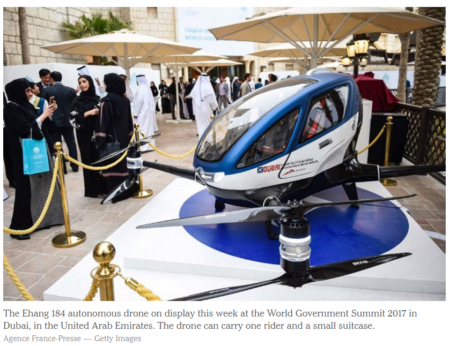 And by using it via small drones like this, short-distance travel becomes much more efficient. I would definitely try out one of these if given the chance. Would you? This entry was posted on Monday, March 6th, 2017 at 10:12 pm	and is filed under technology and tagged with technology. You can follow any responses to this entry through the RSS 2.0 feed. Autonomous cars will energizing negate the need for a people delivery done. “Public transit” will become a whole other thing more efficient than anything we can currently imagine. Not sure how energizing got in there. I wonder how long it’ll be before we can replace cars with these all together. Any idea how much a small drone like this costs? I bet a lot of R&D went into this first model, so it’s probably incredibly expensive. But when mass-produced, I bet they could be around $10k. This is like a jetpack, but better! You don’t have to fly it and you can take naps during your travel from point A to point B. I’ll try it for a very short distance like from one end of Forest Park to the other end. Why not? It drives itself! I can take a nap as I “drive” to work. How awesome would that be. I don’t disagree with you at all 🙂 I just know that I couldn’t do so…car, maybe, hovering over the ground…not so much.